Born in Osaka, 1967, Takuya had ambitions to become an artist and was always consumed by drawings. After graduating high school and working as a store clerk, in 1986 he started working as a DJ, and worked on many genres. 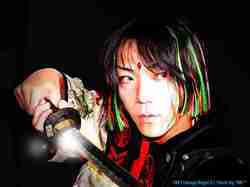 The mixed genre theme carried on to his work, creating the Takuya Angel of today. Taking Kimonos into the 21st century and beyond, Takuya Angel consists of a riot of colors, patterns and shapes. From PVC to antique kimonos as materials, fluorescent and monochromatic colors take inspiration from the environment, angels, childhood and current anime, historical outfits of Japan to create the wild and stylish look of Takuya Angel.